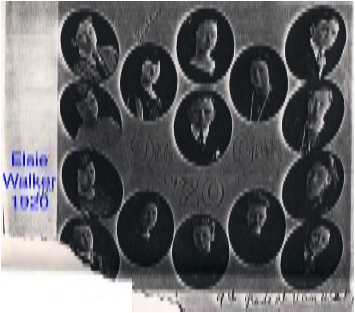 When Everett Walker and Linnie Machlan were married in early 1903 they moved into the upstairs of Grandad Walker's big house. There were two stairways, and they were able to come and go using the back stairway. Elsie was born in grandad's big house. Before the next child was born, Grandad gave dad 90 acres to build his house, barn and other buildings, located about 1/2 mile east of Grandad's house. So of course he had to mortgage the ground to pay for the buildings. Mother was only 18 and dad 20, and they were inexperienced in managing, building, etc. I don't know if grandad helped with machinery or stock. In addition to the 90 acres, dad had to rent some besides to have enough income. 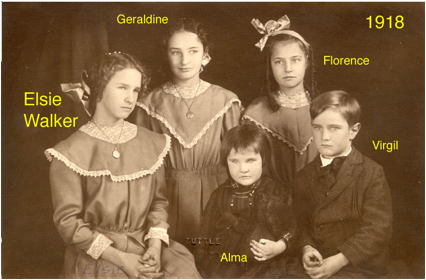 All of the rest of us children were born in the new house, except Alma. A brother, Roscoe Alton, was born next - but he was premature, with a bad heart, and died at age 3 months. 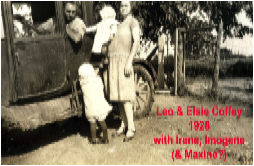 When Elsie was 2 years old and Geraldine was a baby, the family was going down the road in a buggy on a very dark night - either to grandma's or to church. Here came Uncle Homer driving some cows up the road. One was black with a very white head, and the white head bobbing up and down scared the horses. The buggy tipped, throwing mom, dad and Geraldine out of the buggy. Elsie was on her knees holding on tight to the dash board. The team ran over a mile with her in the buggy. The team ran straddle of a post, and the neighbors caught them. Elsie was OK but plenty scared, and dad had a broken collar bone. Believe me, the folks were worried until the team was caught! Geraldine's turn for "adventure" came when she was two, and pulled the tail of a two-year old colt that was tied to the side of the corn crib. "He kicked my teeth out and I had the print of a colt's foot on my face for a while. I had no teeth until it was time for my second teeth to come in." 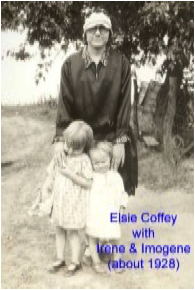 When Elsie was 6 she started to school. All of the kids went to Popcorn school, the same one attended by their father. There were about 20 to 25 pupils in the school. In about 1910, dad almost died from a burst appendix. He was in a coma for 3 days, and the doctor said he wouldn't live. The doctor operated on him on the dining room table in the living room at home, they hung sheets on the walls for sanitation. It seems he was never strong after that. The family quit farming for two years, and moved to Van Wert. He and a Mr. Davis ran a hardware store in partnership - reportedly the partner was a crook. Elsie's sister Alma was born in Van Wert, then they moved back to the farm where they stayed until 1921 . We were one mile from school, and walked when the weather wasn't too bad. On some of the snowy, cold days dad took us in a bob sled. One cold morning, we walked in deep snow, and Florence froze her fingers. All her finger nails came off. She was miserable all day in school. The teacher put her hands in ice water, which was bad. We had an ornery neighbor girl, a little older than Elsie. She was always trying to fight with Elsie on the way to school. She loved to upset our dinner buckets; we often had messy lunches. Our home was like all the rest at that time - no electricity and an outside toilet. We had a wood-burning kitchen stove, which was so cheerful in the winter. There was always a tea kettle on the stove singing, and usually something on the back of the stove cooking. If there was nothing baking we opened the oven door, which let out lots of heat. We had a happy home. Mother kept things so clean, baked delicious bread, and was always good natured. We could hear her singing as she worked. Our chores included keeping the wood box full of wood after we got home from school, picking up corn cobs for kindling, gathering the eggs. We older girls (Elsie, Florence and I) helped milk part of the time and threw down hay from the hay mow, and put corn and oats in the trough for the horses. Sometimes in the early fall Elsie and I went to the field with dad and got part of a load of corn. We were pretty good corn huskers. Our basic income was cream and eggs, and after harvest dad quite often had timothy seed to sell. He also sold hogs. I remember once needing shoes badly, and mother sold hens to get shoes. We usually went to town for groceries Saturday afternoon or Saturday night. All the family went, and we kids loved that outing. We had a two seat carriage, and dad drove a nice team of horses. We took eggs and cream. Dad gave us each a nickel to spend before we left home; those days we could get a fairly nice sack of candy, gum or an ice-cream cone for 5 cents. Dad had a real attractive bay-colored driving team and nice buggy. But the hired hand borrowed it one night to go on a date, and a car without lights ran into them and frightened the team. From then on they were too jittery on the road, and he sold them. His work horses were a big sorrow team also, two older bay mares. He always had nice horses, and fed them so well they were quite frisky. All of us kids at one time or another rode old Rex, the pony, to school. We kids liked playing checkers, dominos and cards. We popped corn quite often in winter evenings. In summer we had play houses in a big, empty corn crib, and loved playing with dolls. We fed two lambs on a bottle one summer. They were quite pets, but when we were in the yard we had to watch them. They would sneak up behind us and push us over. Their names were Bill and Willie. We had a nice hill in our pasture and would slide down it on our little sled in winter. Also in winter on Saturday morning we 4 older kids took our dog and went hunting rabbits. We had no luck, but got lots of fresh air. We of course had no TV. Later, as we grew older, all of us went to Wednesday night movies, and to town on Saturday or Saturday night. There were parties with our Sunday School, we had taffy pulling and wiener roasts. We didn't get much spending money, but on the 4th of July we got 25 cents each. We thought that was great - we could ride the merry-go-round for 5 cents. I don't know who got into the most trouble, but Florence was the tomboy. Not afraid of anything. When they were building the tall barn, Florence went up the ladder to the roof, and dad had to go up and bring her down. We went to a country church at Fairview, where mother was raised. Dad & mother were good church members, and we older girls went two years without missing Sunday School. I remember we got gold star pins to wear on our dress, for the honor of attending without absence. During the war two of mother's brothers served in Europe. The first car owned by the family was a 1911 Carter. We kept it for quite a while before we bought a Studebaker, which had two folding seats to make a 7 passenger - it wore out. 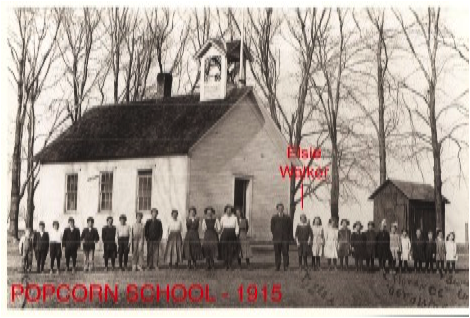 We started high-school in Van Wert, where there were about 30 pupils and 3 teachers. Elsie and I drove the Studebaker to school at Van Wert a few times. We had trouble starting the car after school one afternoon, and had a garage mechanic start it. We asked him how much we owed him, and he said "two bits". Elsie asked "How much is two bits?" I said, "I don't know - give him two dimes". When we got home dad explained that "two bits" was a quarter, but we were too embarrassed to ever give him the other nickel. Usually Elsie & I rode horseback to high school, about 3 and a half miles going north-west. We about froze to death. Sometimes we drove the pony with a buggy. We had to put the horses in a barn a few blocks from the school. It was so cold taking off the bridles and putting on halters - we sure earned the knowledge we received! 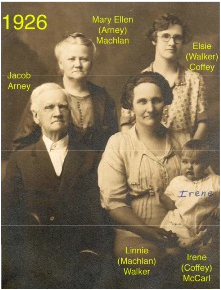 When we were young teenagers Elsie, myself and the Watson girls that lived close by drove their horse to church at Van Wert on Sunday evenings in summer. We enjoyed getting out as none of us were dating at that time. However we were always scared walking from their home to our home (about 3/4 of a mile) later in the dark. But when we got close enough for our dog Rover to hear us he always came out to meet us. Times were hard for the folks, and we had to move in 1921. We moved to a farm North of High Point, where we started going to Garden Grove high school. From here we were able to ride the school bus to school, and there were more like 105 pupils with about 8 teachers. We had cold school houses, with outside toilets. The north class-rooms were so cold we couldn't use one in severe cold weather. We stood around radiators lots to get warm. The school bus was cold when we went to Garden Grove. 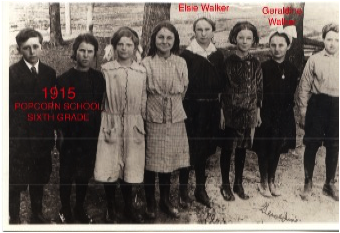 Elsie and I graduated from high-school in Garden Grove in 1923. We graduated the same year because I started to school at age 5 and she started at age 6, and because when I was in 7th grade I was the only 7th grader (not counting one boy who was almost always never there), so the teacher put me in with the 8th graders. Our land-lord was hard to get along with, so we moved to north of Leon. Elsie worked in Des Moines until she was married. I went back to school at Garden Grove for Post-graduate, so I could teach when I was 18 years old.